Purchase of a Vauxhall Victor at Watson's Motors Limited in 1960. Homepage. 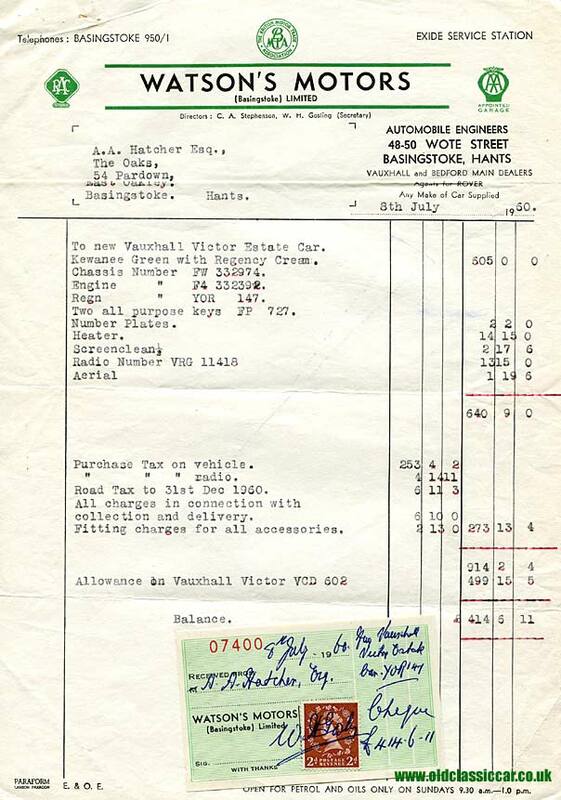 This page: Invoice for the sale of a new Vauxhall Victor in Basingstoke, July 1960. Watson's Motors Limited of Basingstoke, July 1960. Mr Albert Hatcher, of The Oaks, 54 Pardown, East Oakley, definitely liked his new Vauxhalls. Less than twelve months after purchasing a Vauxhall Victor from Broadway Autos of Cricklewood (invoice for that purchase here), he was sat around the table in the offices of Watson's Motors (Basingstoke) Limited, negotiating the purchase of a brand new Victor Estate car - registration YOR 147. Finished in "Kewanee Green with Regency Cream" (two-tone paint, or exterior and trim colours? ), the car - with optional heater, radio and aerial - would cost him £640 9s 0d, before the delights of Purchase Tax (levied on both the car and the radio), Road Tax, and some sundries were added, bringing the total to £914 2s 4d. Against this he was allowed just under £500 for the Vauxhall he'd bought in 1959, bringing the final total to pay down to £414 6s 11d. In addition to being main dealer agents for Vauxhall cars, Watson's also held franchises for Bedford commercial vehicles, and Rover cars, although if Sir or Madam preferred the products of Austin, Morris or Hillman for example, they'd be more than willing to oblige. In addition they could supply motor accessories, for instance Exide batteries and vehicle lubricants, and also retailed petrol from the forecourt pump(s) outside their premises at 48-50 Wote Street in the town. The engineers at this garage were both AA and RAC approved. Once again, Mr Hatcher didn't leave it long before deciding to sell his car. Documented in a separate invoice, he was back at Watson's in November 1961, signing on the dotted line for a brand new Victor Estate, this time in "Glade Green and Alpine Green". A heater was again chosen from the options list, although no mention of a radio this time. The car he'd bought above in 1960, registration YOR 147, was part-exchanged against the new car, registration 609 COT, for which he was allowed £615 19s 7d, bringing his total outlay for the '62 Victor to £293 0s 0d. As far as I can tell from the papers I have here, he ran the '62 car for at least 13 months. In 1963 he traded a Ford Cortina at a different garage against ... another new Victor Estate! Whether this joined the '62 car on his driveway or not I've no idea, but there's no doubting his loyalty to the Griffin badge throughout the 1960s, as further invoices - to be added in shortly - will testify to.